India is now the US of the Asia Pacific Region. As much as we already know about the e-commerce wars, the competition to get the consumer’s attention for just 10 minutes, is a race all the etailors are competing in right now. Gartner, a foremost American consulting firm based in Connecticut reveals that India eCommerce market will reach $6 billion in 2015 a 70 percent increase over 2014 revenue of $3.5 billion. A 70% increase is not just a number, it shows the extravagant appeal e-commerce has on the common man. 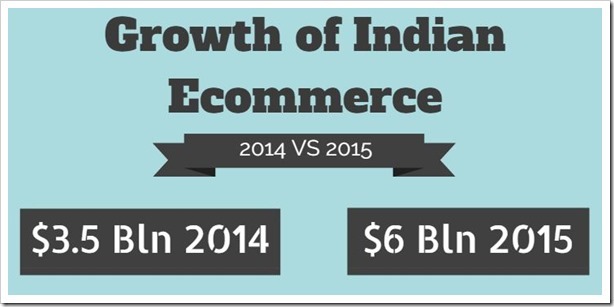 “Digital commerce is at a nascent stage in India. However, India is one of the fastest-growing e-commerce markets in Asia/Pacific, “said Praveen Sengar, research director at Gartner. “India represents a $3.5 billion market, growing at approximately 60-70 percent every year. It represents less than 4 percent of the total retail market. B2C e-commerce leads the market in India, while B2B is limited to organizations that drive online channels to integrate with their partners and distributors.” he added. What makes it further easy for users is the availability of high performance smartphones that are made affordable. Broadband, which was a luxury then and a necessity now, has grown three folds in last 2 years. In a Forbes report, it was revealed that India has 243 million internet subscribers, a number that surpasses even US internet subscribers! The money being drawn in is also huge with Flipkart raising $1billion, Amazon with $2billion and Snapdeal following the lead with $650M. Gartner also mentioned in the report that this bullish trend shows no signs of slowing down. Talking about the penetration into Mobile internet consumption, many e-commerce giants have paid more attention in “mobilizing” their web pages for hassle-free user view. “Mobile commerce will help organization skip the desktop wave with increasing penetration of affordable smart devices with connectivity and a rapidly growing ecosystem to engage customers on mobile. Thirty percent of traffic for eCommerce sites come from mobile and tablets,” the report said. From food to furniture, mobiles to kitchen ware, appliances to clothes, the sky is the limit for selling on these B2C e-stores. With easy access, low prices, effective supply chain, numerous vendors, various payment options, the modern e-shopper is spoilt for choice. “Limited internet penetration, low digital commerce volume, multiple payment models (e.g., cash on delivery, credit card and wire transfers), logistics and fulfillment challenges, higher return rates and low average order value is putting pressure on the profitability and viability of B2C eCommerce businesses.” the report quoted. With 200+ million population on various social media networks, personalization with consumers is numero uno strategy for most of the etailors. Long live the e-commerce czars!